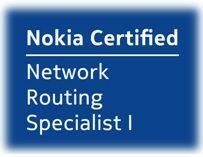 NRS I (Nokia Network Routing Specialist I) is the Entrance Certification of Nokia (formerly Alcatel-Lucent) Service Routing Certification (SRC) Program. So, Nokia Scalable IP Networks Exam is the starting point for Service Provider Architecture and Nokia IP World! With NRS I, Nokia Scalable IP Networks trainning, you learn Networking Fundamentals, Routing Protocol Basics, TCP/IP, Ethernet and Overview of Nokia L2/L3 VPN Services. Beside, you gain basic Hands On Experience on Nokia Service Routers. Hey Buddy!, I found this information for you: "NRS I". Here is the website link: https://ipcisco.com/course/nrs-i/. Thank you.